WHAT WERE THE MOST INTERESTING SCIENCE NEWS ARTICLES FROM 2010? Energy cannot be created or destroyed, but it can be saved in various forms. One way to store it is in the form of chemical energy in a battery. When connected in a circuit, a battery can produce electricity. A battery has two ends -- a positive terminal (cathode) and a negative terminal (anode). If you connect the two terminals with wire, a circuit is formed. Electrons will flow through the wire and a current of electricity is produced. Inside the battery, a reaction between chemicals take place. But the reaction takes place only if there is a flow of electrons. Batteries can be stored for a long time and still work because the chemical process doesn't start until the electrons flow from the negative to the positive terminals through a circuit. Let's start with a very simple battery that uses a lemon that has two different metallic objects inserted into it, for example a galvanized nail and a copper coin or wire. The copper serves as the positive electrode or cathode and the galvanized (zinc coated) nail as the electron-producing negative electrode or anode. These two objects work as electrodes, causing an electrochemical reaction which generates a small potential difference. Since copper (Cu) atoms attract electrons more than zinc (Zn) atoms, if you place a piece of copper and a piece of zinc in contact with each other, electrons will pass from the zinc to the copper. As the electrons concentrate on the copper they will repel each other and stop the flow of electrons from zinc to copper. On the other hand, if you put strips of zinc and copper in a conductive solution, and connect them externally with a wire, the reactions between the electrodes and the solution will allow the electrons to flow continuously through the wire. A lemon battery is made with a lemon and two metallic electrodes of different metals such as a copper penny or wire and a galvanized (zinc coated) nail. The energy for the battery does not come from the lemon, but rather the chemical change in zinc (or other metal). The zinc is oxidized inside the lemon, exchanging some of its electrons in order to reach a lower energy state, and the energy released provides the power. The lemon merely provides an environment where this can happen, but they are not used up in the process. Assuming that zinc and copper electrodes are used (such as a copper coin and a zinc plated nail) then a single lemon could generate approximately 0.9 Volts. 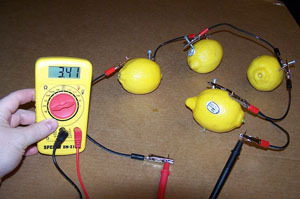 To the left a series circuit of lemons shows 3.41 volts being produced. NOTE: Potatoes, apples, sauerkraut, or any other fruit or vegetable containing acid or other electrolyte can be used, but lemons are preferred because of their higher acidity. In potatoes, for instance, the electrolyte is phosphoric acid, while in lemons it is citric acid. What makes the electrons move? When you let go of a ball you are holding it falls to the ground because the Earth's gravitational field pulls the ball down. In a similar way charged particles such as electrons need to have work done to move them from one point to another. The amount of work per unit of charge is called is called the electric potential difference between the two points. The unit of potential difference is called the volt. The potential difference between the cathode and anode are set up from the chemical reaction. Inside the battery electrons are pushed by the chemical reaction toward the positive end creating a potential difference. It is this potential difference that drives the electrons through the wire. Potential difference can be positive or negative, likened to gravitational energy, moving up a hill or down a hill. In a battery the flow of electrons is downhill... electrons can flow uphill as in the case of a battery charger. Why don't electrons just move from anode to cathode inside the battery? The electrolyte in the battery keeps lone electrons from going straight from the anode to the cathode within the battery. When the terminals are connected with a conductive wire, electrons can easily flow from anode to cathode. What direction do electrons move in the wire? Electrons are negatively charged, so they will be attracted to the positive end of a battery and repelled by the negative end. When the battery is hooked up to a device that lets the electrons flow through it, they flow from negative (anode) to positive (cathode) terminal. Who invented the electrochemical cell (battery)? 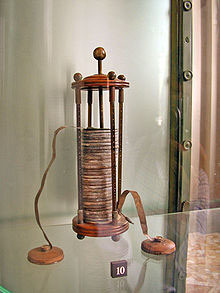 The battery made by Volta is credited as the first electrochemical cell. It consists of two electrodes: one made of zinc, the other of copper. The electrolyte is sulfuric acid or a brine mixture of salt and water. The electrolyte exists in the form 2H+ and SO42-. The zinc, which is higher than both copper and hydrogen in the electrochemical series, reacts with the negatively charged sulfate SO42- . The positively charged hydrogen ions (protons) capture electrons from the copper, forming bubbles of hydrogen gas, H2. This makes the zinc rod the negative electrode and the copper rod the positive electrode. The copper does not react, functioning as an electrode for the chemical reaction. How does a modern battery (zinc-carbon battery) work? 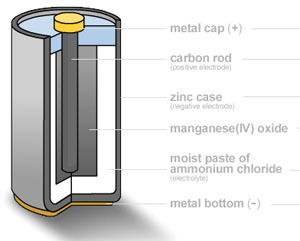 A zinc–carbon dry cell or battery is packaged in a zinc can that serves as both a container and negative terminal (anode). The positive terminal is a carbon rod surrounded by a mixture of manganese dioxide and carbon powder. The electrolyte used is a paste of zinc chloride and ammonium chloride dissolved in water. The carbon (graphite) rod is what collects electrons coming from the anode portion of the battery to return to the cathode portion of the battery. Carbon is the only practical conductor material because every common metal will quickly corrode away in the positive electrode in salt based electrolyte. The zinc is oxidized according to the following half-equation. and the CL combines with the Zn2+. The battery has an e.m.f. of about 1.5 V.
Used in Duracell® and Energizer® and other alkaline batteries. The electrodes are zinc and manganese-oxide. The electrolyte is an alkaline paste. These are used in automobiles. The electrodes are made of lead and lead-oxide with a strong acid as the electrolyte. These batteries are used in cameras for the flash bulb. They are made with lithium, lithium-iodide and lead-iodide. They can supply surges of electricity for the flash. Lithium battery These batteries are used in cameras for the flash bulb. They are made with lithium, lithium-iodide and lead-iodide. They can supply surges of electricity for the flash. Lithium-ion battery These batteries are found in laptop computers, cell phones and other high-use portable equipment. Nickel-cadmium or NiCad battery The electrodes are nickel-hydroxide and cadmium. The electrolyte is potassium-hydroxide. Zinc-carbon battery or standard carbon battery – Zinc and carbon are used in all regular or standard AA, C and D dry-cell batteries. The electrodes are made of zinc and carbon, with a paste of acidic materials between them serving as the electrolyte. Zinc Carbon Battery - How do they work? 3. Which statement is true about a lemon battery? b) The battery is made with two metallic electrodes of different metals such as a copper penny or wire and a galvanized nail. c) In a lemon battery, both oxidation (loss of electrons) and reduction (gain of electrons) occur. 4. Which type of battery is used in computer laptops and cell phones? 5. What were the main components of Volta's first electrochemical cell? Some this text or images used have been obtained from Wikipedia, the free encyclopedia, therefor all text is available under the terms of the GNU Free Documentation License (see Copyrights for details). Disclaimers. Wikipedia is powered by MediaWiki, an open source wiki engine.